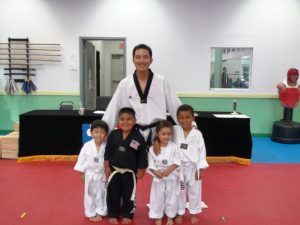 Han Bros Taekwondo is not your typical Martial Arts studio! We offer the highest standard self-defense programs for children, teens to adults. Our training helps you maintain a healthy lifestyle, being a high-intensity form of exercise, targeting core strength and stress relief. The Master Instructors will continually emphasize the importance of the five Tenants of Taekwondo; Courtesy, Integrity, Perseverance, Self-Control and Indomitable Spirit. 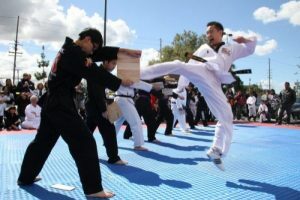 Han Bros Taekwondo studios are the best in Martial Arts training and discipline in the valley! We understand how important it is to start learning taekwondo at an early age, having done so ourselves. We teach our Little Tigers classes with the same methods and passion that we benefited from when we were kids. The students in this class will learn the basics of the art of taekwondo, plus receive a range of healthy, physical benefits. We are excited about the opportunities this class brings, providing kids with great exercise and vital life skills, all delivered through taekwondo. These are playful, game-like sessions that represent high-intensity exercise, developing children’s motor skills and enhancing their balance and coordination. We believe this to be a life skills program, it’s purpose to develop a child’s focus, patience, respect and self control. These are not only principles of taekwondo, but standards everyone must meet in life, and we take pride in instilling these qualities early on in their lives. In our classes, we use positive dialogue response which helps to motivate our students and make them feel more comfortable in the dojang. With this, we can begin to help them improve their self-confidence and courage. Positive reinforcement allows us to engage with all of our students and meet them at their level and individual circumstance. We have worked with children with ADD and ADHD, and those with other special needs. Our Little Tigers classes use the taekwondo principle of respect: all the children receive ours and receive the same standard of teaching tailored to them. Providing a physical exercise outlet also brings psychological benefits, allowing the students to express themselves and channel – and control – any stresses or frustrations. At the end of their Little Tigers program, students will graduate with a purple belt and be invited to attend our middle class. This is a high-energy, challenging and exciting program. Success for children in this program is down to what they are doing in and out of the dojang. In order for the students to be promoted to the next belt rank, we put a heavy emphasis on how well they do in school and at home. We provide each child with a personal monthly progress worksheet – a star program. This monitors how the student is performing away from taekwondo, typically relating to tasks at home and in their school. 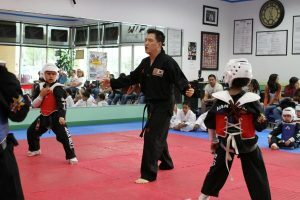 Our Masters teach more than just taekwondo techniques; we support the students in developing as individuals – as children – growing into teenagers and then young adults. The art encompasses more than just self-defence, the principles stretch beyond that to who we are as people. We are as passionate about that as any other aspect of taekwondo, particularly in this program’s young age range, continuing the instruction we received when we were children. Students will be tested every other month to assess whether they can be promoted to the next belt rank. Are you an active or retired police, military, firefighter or other action based career oriented person or are you a college student who needs something more than what a typical GYM can offer you? Then you will LOVE Han Bros Taekwondo. We firmly believe it is never too late for someone to start learning about the art of Taekwondo. There is no age limit, nor ability requirement, for any adults to join this program. Each class centres on dynamic energy and features an accelerated training style. This combination provides a taekwondo experience that is exercise-intensive, while also being educational – supplying you with a good knowledge of taekwondo. Each session will help you to relieve stress and tension, focussing your mind on self-improvement through learning a new skill. Throughout the program you will also improve your strength, focus, concentration, flexibility and enjoy the dynamic Martial Arts studio discipline style instruction.